A major expression of Chinese civilisation and a many-facetted material, jade belongs to the most ancient history of Chinese art. A tablet from the Neolithic Longshan culture (2300 – 1800 B.C.) 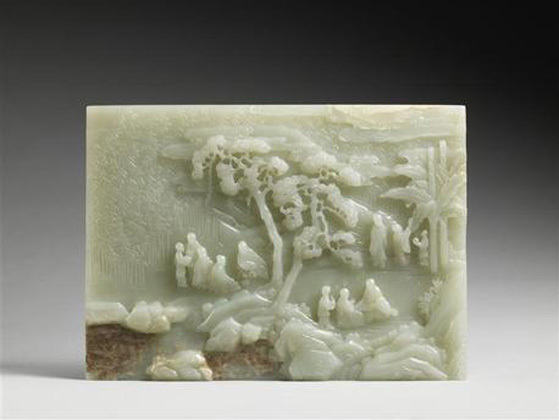 evokes the precious lapidary who accompanied the emperor Qianlong all his life, for poems and seals to be engraved on the most beautiful jades of his collection. Contemplated in the form of simple polished tablets offered as princely gifts, animal motifs drawn from an imperial bestiary, bowls, brush pots on the theme of literati or, in a more warlike manner, formidably sharp blades, jade is not only prized by emperors of China, sultans of Samarkand, Mughal sovereigns and Safavid shahs of Iran. For the Chinese it is more precious than gold and it enjoys an incomparable appeal in Europe, when Eastern jades appeared in the French royal collections in the 17th century, as attested by Cardinal Mazarin’s exceptional bowl. The “Chinese Museum” of Fontainebleau formed by the Empress Eugénie presents the last jades, especially of the Qing Period (1644 – 1911), to enter the collections of the French sovereigns and coming from the sack of the Summer Palace in Peking. Later, Art Déco took over all the themes and all the periods of Chinese art, respecting in each “fragment of ancient art” the natural glow of jade, rock crystal or lacquer. To the delight of women of fashion, in the early 20th century the Maison Cartier wrote a new episode in the taste for China in Paris, raising fine jewellery to its greatest level of excellency. This is shown by the exceptional jewels worn by some celebrities in the early century: the countess and art patron Mona Bismarck, the American Barbara Hutton whose necklace made of 27 beads of jadeite, inlaid with platinum, gold, diamond and ruby, will be displayed in the exhibition. The exhibition will close on a large Coromandel lacquer screen produced under the reign of the emperor Kangxi (1662 – 1722), a furnishing item much sought after by the 18th-century European aristocracy. In a set design inspired by China, punctuated with openwork wood exhibition screens, jade, in the entrance gallery of the exhibition, will lend itself to the visitors’ “touch”: two stone blocks, one rough and the other polished, are available to visitors, so each one will be able to feel all the richness of the material, together firm, soft, smooth, veined. The exhibition is made possible by the exceptional loan from the National Palace Museum, Taipei.